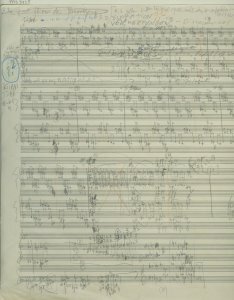 Description	 MS in German on paper, Hamburg, Germany, 1976, 1 p., 28x40 cm, single column, (27x39 cm), 24 ruled staves with music notated on 4 staves, marginal annotations in capitals and cursive script, autograph, signed. Provenance	 1. Györgi Ligeti, Austria (1976); 2. A. Janke, Berlin? 3. Musikantiquariat Dr. Ulrich Drüner, Stuttgart, Feb. 2009. Commentary	 Györgi Sándor Ligeti (1923-2006) came from a Hungarian Jewish family in Transylvania, Rumania and became Austrian citizen. 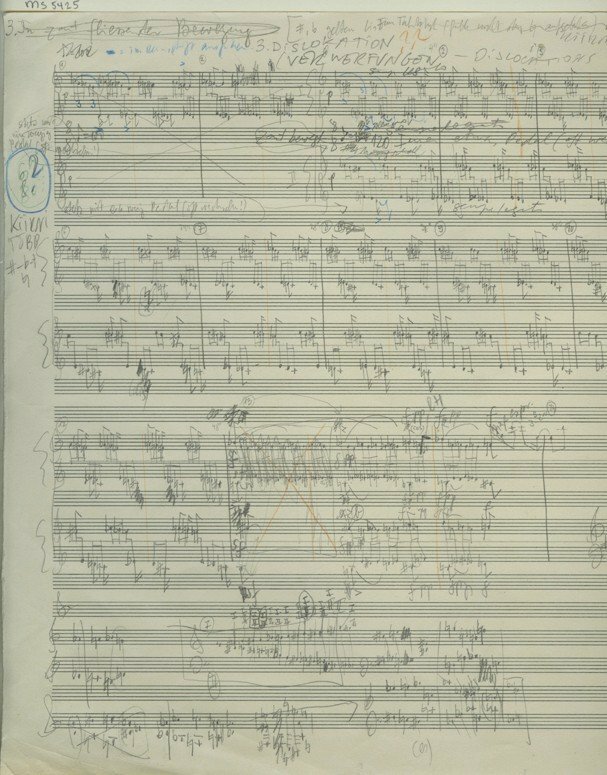 Ligeti's earliest works are in the style and continuation of Béla Bartók. He then wrote electronic music alongside Karlheinz Stockhausen. After this he developed the technique known as "sound mass" and "micropolyphony", and wrote serial music. From 1970'es Ligeti turned away from total chromaticism and concentrated on rhythm. When he wrote the 3 pieces for 2 pianos in 1976, he had four years earlier heard the music of Steve Reich and Terry Riley; this reflected in the titles of the 3 pieces: I. Monument. II. Selbsporträt mit Reich und Riley (und Chopin ist auch dabei). III. In zart fliessender Bewegung. The Sketchleaf is titled "Verwerfungen - Dislokation". The main structure or musical content is the rhythmical dislocation between the two piano players, who frequently use similar figures, but just not at the same time. The continuity draft, ending in mere sketches, uses clusters and a great variety of very small repetitive elements, progressing slowly through the compass in order to form a "sounding picture".